Sorry for being short on blogging today, been pretty busy getting ready for tomorrow's releases. -Where a month ago we were looking at a McCain +11 electorate we are now looking at a McCain +4 electorate. There's certainly still a way to go in closing the enthusiasm gap since Barack Obama won the state by six points a year ago but that's progress for Creigh Deeds. -Bob McDonnell still leads Deeds by a lot among independents, 60-29. -While McDonnell is winning 93% of the vote from people who say they voted for Jerry Kilgore in 2005, Deeds is only getting 76% from folks who claim to have voted for Tim Kaine. -Independents give both Democrats and Republicans a 25% approval rating, but they must dislike the Democrats more because the GOP has a 40-31 lead on the generic ballot with them. -Party ID among conservatives is seeing a strong Republican trend over the course of this year- in April we found 58% identifying with the GOP and 21% with Democrats, those numbers are now 67% and 14%. -Among voters who don't like Congressional Democrats or Congressional Republicans, the GOP has a 50-14 lead on the generic ballot- that's one positive of being out of power I suppose! This has all been on Twitter for a while now, follow us. It was pretty clear from our poll last week that Blanche Lincoln has a problem with her base- only 62% of Democrats approval of her job performance. What's much less clear is what she should do about that, particularly when it comes to the health care issue. Among folks in her party who don't approve of her job performance, 40% say they support the President's goals on health care and 41% say they oppose them. So no matter which way she goes she's either going to antagonize the progressives in her party unhappy with her or the conservatives, and they're pretty equal in numbers. -Among Democrats who don't approve of Lincoln and support Obama on health care, 72-74% of them still support Lincoln in her head to head contests against the Republican trio we tested. -Among Democrats who don't approve of Lincoln and oppose Obama on health care, only 15-21% of them support Lincoln in her head to head contests against the Republican trio we tested. There's a couple ways to look at that- one is that so many of those conservative Democrats are just going to cross over anyway that there's no point in her trying to appease them. But the other is that she has more work to do to keep those folks in the party fold because voting Republican is a viable alternative for them, while the liberals will hold their nose and vote for her no matter what due to the lack of a real alternative for them. It seems like more often than not it's the latter scenario that plays itself out. We have two polls in the field right now, a national one looking at the Congressional picture for next year and our monthly Virginia survey. Some early numbers on the Congressional one- out of the first 119 respondents 47 said they would reelect their representative next year, 41 said they would not, and 31 said they were unsure. Now it likely won't play out that way in real life- when people see the alternatives a lot more of them will probably vote for what they have- but it's a good picture into the discontent out there right now. The numbers of seats shifting would be in triple digits if it really did work out that way. 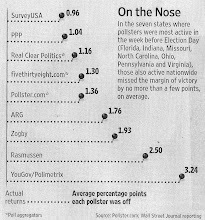 -George Allen appears to be more popular than Barack Obama with the 2009 electorate. -Creigh Deeds seems to be doing marginally better than a month ago but is still down by a good bit. Finally, we need to get North Carolina into the field on Tuesday and I'm having a harder time than usual thinking up questions so if you have suggestions I'm quite open to them. Two that we put on the Virginia poll came either from blog comments or Twitter suggestions. So when we polled Colorado two weeks ago I was planning to test Andrew Romanoff as a primary challenger to Michael Bennet just to see how it would shake out, but several folks from the state told me there was no way that was going to happen so I skipped it. I'm sure they were right at the time, but lo and behold the Denver Post reports this morning that he's going to get in. Sure wish we had that data right now! It's a good reminder that never rarely really means never in politics. Anyway, Bennet's overall numbers obviously were not good on our survey last week, but how susceptible is he to a primary challenge? His approval rating with Democrats on the poll was 57%, which is pretty weak. But I think the more significant number in this context is his disapproval rating among party voters, which was only 12% on the poll. That's a pretty significant indication that while Bennet may not be Mr. Popularity yet, there also isn't a huge group of voters in his party dying to nominate somebody else. Combine that with Bennet's solid fundraising tally and you have a pretty uphill battle for Romanoff, although it's not impossible. I am not of the mind that contested primaries are necessarily a bad thing- going back through the last couple election cycles I think Kay Hagan, Jeff Merkley, Jim Webb, and Jon Tester all benefited to some extent as first time statewide candidates by having to put themselves before the voters earlier in the year- it helped to build up name recognition and base enthusiasm for their candidacies and served as a good test run for the general. If this challenge really does play out in Colorado it may make the winner a stronger and tougher candidate in the fall. Can Crist avoid the curse? Outgoing Delaware Governor Ruth Ann Minner did her successor Jack Markell a really big favor by appointing Joe Biden's replacement before she left office, because it's been tough times for the other Governors who have appointed Senators this year. Rod Blagojevich is obviously the most well known example of this since he tried to sell the seat and then got impeached, but David Paterson in New York and Bill Ritter in Colorado have had more mundane issues with their political fortunes since making appointments to fill vacant seats. When we polled Colorado in December, right after the news of Ken Salazar's cabinet appointment, Ritter had a 49% approval rating, including a 54% mark with Hispanic voters. But when we came back to the state in April, after the appointment, his approval had plummeted to 40%. Beyond that he was trailing Scott McInnis 48-41 in a hypothetical contest, including a 45-42 deficit among Hispanics, who may have been perturbed that Ritter didn't appoint another Latino to replace Salazar. David Paterson's approval rating was above 50% in all but one New York poll conducted between the beginning of September and the middle of January. Then he by all accounts bungled the appointment of Hillary Clinton's replacement and since mid-February almost every approval poll has shown him with numbers in the 20s, with some even dipping into the teens. Paterson went from having held a solid lead in every poll testing him against Andrew Cuomo to getting clocked in all of them. Blagojevich, Ritter, and Paterson's issues certainly aren't completely attributable to having to make Senate appointments but that played a big role. It's going to be very interesting now to see how Florida voters react to Crist's choice- you could argue that any fallout will be minimal because he is so popular- but Paterson had Crist like approval numbers before his appointment and that didn't stop them from plummeting. If Crist gets effectively attacked for cronyism by both the right wing of his party and Democrats, this could get interesting. Was Obama's approval ever that high? For most of 2009 PPP and Gallup have evidently been polling two different countries. Our March poll had Barack Obama's national approval rating at 55%. Theirs at the same time had it at 62%. In April we were at 53%, they were at 63%. In May we were at 55%, they were at 65%. In June we were at 52% and they were at 61%. In July we were at 50%, they were at 60%. Now, after showing Obama's approval ten points behind them all year, they're at 50% and we're actually at 52%, actually finding him slightly more popular. How the heck do you explain that? I'm pretty sure it's because people are more honest with automated polls than they are with live interviewers. I don't think Obama's approval rating was ever really as good with independents and especially Republicans as some polls were showing it. But I think folks were being more charitable to him in live interviews than their true feelings a) because they felt like they should pretend they were at least giving a new President a chance and b) because they were hearing all the time about how popular Obama is and let's face it, people don't want to be different. We showed Obama's approval with Republicans at only 14% as far back as March, at a time when most other pollsters were showing it in the high 20s or even the 30s. We find it at basically the same place now- 16%- but now every other survey from the last three weeks that pollster.com has on its Republicans only chart also shows it lower than 20%. It's a similar story with independents. In March we already had him polling in the low 40s with them, but most polls in a similar time frame had him in the middle to upper 50s. We still have him in the 40s with them, and so does every other poll that's come out this month that Pollster has it broken out for. There has not been a similar discrepancy between our numbers and others among Democrats. In March most everyone, including us, had him in the high 80s or lower 90s, and now most polls show him around the mid 80s. Here's what I think: Obama never really had the approval of very many people who didn't vote for him. I'm really not sure why he would have- he made it pretty clear what he stood for last fall and if folks didn't like it enough to vote for him then, I'm not sure why they would have approved of his job performance at any time this year. And I think our polling (and Rasmussen's) has pretty much reflected that throughout 2009. So why are the live interviewer numbers converging with ours now? Health care, the town halls, and the greater level of dissatisfaction coming across in the media has made Obama disapproval more socially acceptable and I think folks now are letting their true feelings out when they get polled regardless of whether they're talking to a real person or IVR. I don't think Obama's numbers are really crashing- I just don't think his true level of approval was ever that high to begin with. I think he has seen some drop in popularity, but a very modest one, probably in the 3-5 point range. That's my theory anyway- someone smarter than me would have to figure out how to prove or disprove it. Last year young voters were a big key to Democratic success in North Carolina. Exit polls showed 74% of them voting for Barack Obama, and his coattails helped Bev Perdue and Kay Hagan each win 71% of their support as well. Voters under 30 in the state have always tended to be more progressive, but last year was something completely new. In 2004 John Kerry won 56% of their votes and Erskine Bowles got 57%. A big question then becomes whether last year's results are a permanent predictor of how young people in North Carolina are going to vote, or whether it was a one time blip due to Obama's presence on the ballot that's not transferable to other elections. Our polling data from the last three months would indicate that it's the latter case: younger voters are pretty Democratic, but not nearly to the extent the 2008 election results indicated. 51% of voters under 30 identify as Democrats to 29% as Republicans and 21% as independents. Looking specifically at the 2010 Senate race, 44% of them say they'll support a generic Democratic candidate to 29% supporting Richard Burr. Allocate the undecideds and you have the Democrat leading 60-40, an indication that the 2004 results in the state among young people are probably more reflective of the permanent reality than what happened last fall. A lot of attention has been paid to the impact that decreased black turnout might have on North Carolina's races next year but young people could be just as important to watch not just in terms of the quantity that turn out but also whether they're really as monolithically Democratic as last year's numbers indicated. His potential ability to generate turnout and support from young people is one of Cal Cunningham's strongest selling points as a possible Senate candidate. I think there is a possibility- remote but real- that 2010 could be a Republican year and Richard Burr would still lose. That ties in with the 'bad year to be an incumbent regardless of party' theory I talked about a few weeks ago. Here's some statistical data on that in North Carolina: 9% of voters in the state disapprove of both Kay Hagan and Richard Burr's job performance- those voters not surprisingly also give Barack Obama a 35% approval rating and only 12% like Bev Perdue. So these are the voters who basically don't like anybody. They're a Republican leaning lot. 53% of them say they voted for John McCain last year to just 36% picking Barack Obama, and 45% are conservatives. These folks should be Burr voters- only 28% of them support the President on health care. But they prefer a generic Democrat to him 52-28, and Cal Cunningham and Kevin Foy lead him in head to head contests. These folks are just mad in general and rather than taking it out on the party in control, they're taking it out on the person they can control, which in this case just happens to be Burr. I don't know if they'll keep that attitude all the way until November 2010- they might decide to support Burr as the lesser of two evils- but they could swing a close election. They're certainly a group we'll be watching as this contest unfolds. Charlie Melancon is in the race for Senate in Louisiana. When we polled him against David Vitter in July he trailed 44-32, but of course when we first polled Kay Hagan against Elizabeth Dole at the same time in the 2007 election cycle she was down 43-27 and went on to a nine point victory. The similarity between those races at this stage is that despite her early lead Dole had some baggage for her opponent to exploit and it's certainly the same case with Vitter. Beyond that though we have some very interesting data from within that July poll that shows the possibilities for Melancon. Independent voters in Louisiana are some of the most conservative in the country. Barack Obama's approval rating with them is just 30%. And the independent voters in Southeastern Louisiana are even more conservative than the ones statewide- just 21% of them gave the President good marks when we polled there. Beyond disliking the President, they actually like David Vitter more than the rest of the state does. His favorability with independents there is at 48%, better than his 44% number with the overall electorate. For all that Melancon led Vitter with independents in that part of the state 50-37 on our poll. It's not a surprise- those are the same folks who have made it possible for him to serve three terms in Congress from a strongly Republican leaning district- and their support for him appears to be transferring to a statewide bid at this point. The big question then is whether Melancon can translate the success he's had with those folks statewide- if conservative Democrats and independents in places like Monroe and Alexandria will find him as appealing as those in his Congressional District have. And also of course whether he can win over those folks while also generating enough enthusiasm from black voters to ensure that they turn out in an off year election. Melancon certainly starts as an underdog, but he's shown he can find a path to victory in places where it's not easy for Democrats before. Our Arkansas poll this week has been mostly bad news for Democrats so far, but here's something positive: Mike Beebe continues to be the most popular of the more than 50 Governors and Senators we've taken an approval rating for across the country so far in 2009. 63% of voters in the state approve of the job he's doing with only 17% disapproving. He gets good marks from 76% of Democrats, 59% of independents, and even 50% of Republicans, something very unusual with the current level of polarization in American politics. Another interesting anomaly in his numbers is that at 64% his approval with whites is actually higher than his 58% with African Americans, something we've never found to be the case before with a Democratic politician. No serious opposition to Beebe for reelection has stepped forward yet, but just to get some idea of how he would match up against a Republican we tested State Representative Allen Kerr. Beebe leads Kerr, who has only 4% positive name recognition, 55-24. Beebe's reelect number running behind his approval number is a function of only 24% of GOP voters saying they would vote for him, even though they approve of the job he's doing. Arkansas may be a battleground next year, but it seems pretty safe to say that's only because of the Senate race. -We're polling Virginia this weekend. If you have any ideas for questions we should ask beyond the basic horse race stuff we are open to hearing them. -Curious that the DNC is running ads propping up Bob Etheridge and Brad Miller...do they need it? Certainly not as far as I know. -People seemed to be surprised by Blanche Lincoln's poll numbers today...that speaks to the differences in perceptions about states that see frequent public polling and those that do not. If there was a Chris Dodd poll today for the first time in five months people would be shocked by it but since Connecticut gets surveyed all the time we're desensitized to it now. I have a feeling if someone was polling Arkansas every month we probably would have seen this coming to a greater extent. Here's an interesting finding from our national poll last week: even with the President in a bit of a rough patch he's still more popular with conservative Democrats than any of his potential opponents for 2012 are with moderate Republicans. 69% of conservative Democrats approve of how Obama's doing compared to 17% disapproving. The best any of the GOP hopefuls do with the moderate wing of their party is Mike Huckabee's 54% favorability rating with 17% viewing him unfavorably. He's followed by Sarah Palin at 53/30, Mitt Romney at 45/20, and Newt Gingrich at 44/29. It's a similar story with the horse race numbers. The Republicans get 57-63% with their party's moderates with Obama pulling anywhere from 24% against Huckabee to 32% against Palin. Obama gets 67-73% with his party's conservatives while losing anywhere from 17% against Romney to 25% against Huckabee. If Obama does better with conservative Democrats in 2012 than his eventual opponent does with moderate Republicans, there's very little chance he loses. It's been pretty clear from the town halls that Barack Obama's detractors are more fired up on health care than his supporters but we have some interesting poll data to back that up now too. We've asked about this issue on four polls now- a national one and state surveys in Arkansas, Colorado, and North Carolina. On each of those we found that among respondents who approve of the job Obama is doing as President support for him on health care is somewhere in the 70s. In North Carolina it's 79-4, in Colorado 77-7, nationally 75-6, and in Arkansas 73-10. Note that in all four instances 16-19% of his supporters reported having no opinion. There is no such ambiguity about the President's actions on health care among respondents who disapprove of his overall performance. In Colorado those voters are opposed to him 97-0 on the issue. It's 97-1 in Arkansas, 95-2 in North Carolina, and 95-2 nationally. With these voters only 2-3% have no opinion. This is one case where scientific data does match the public perception that Republicans are more motivated on this issue. Gilbert Baker is viewed favorably by 7% of voters in Arkansas. For Curtis Coleman it's 6% and Tom Cotton it's 4%. The immediate conclusion from those numbers would logically be that Republicans have no chance of beating Blanche Lincoln for reelection in Arkansas. But in a state where the President has the support of less than 30% of the electorate on health care anything's possible right now and despite their virtually nonexistent name recognition Baker, Coleman, and Cotton are all in statistical ties with Lincoln in potential head to head contests. Lincoln polls at 40% against all three of the Republicans. Baker and Coleman lead her with 42 and 41% respectively, while Cotton trails with 39%. The numbers of course are more a reflection on Lincoln's standing than that of the Republicans. Her approval rating is now 36%, with 44% of voters in the state disapproving of the job she's doing. That's a 13 point downward shift in her net approval rating, from 45/40 when we measured it in March. That largely tracks the 18 point decline in the President's popularity over that time. Lincoln's approval rating is 14% with Republicans and she only gets 9% of the GOP vote in the head to head contests, that's no surprise. Her bigger problems are with Democrats and independents. Among all Democrats her approval is a relatively weak 62%. But among conservative Democrats it's just 45%. While liberal unrest about her actions in Washington has perhaps received more attention her approval with them is 24 points higher, at 69%. Matched against the Republicans Lincoln averages just a 57-25 advantage with the conservative wing of her party, a standing she'll probably need to improve on before next November. Although the dissatisfaction of liberals within her party may not be as a big of a numerical concern for Lincoln as the conservatives, there are some issues there as well. Her approval rating among voters who think that Obama is doing a good job is just 63% with 21% disapproving and 16% unsure. That failure to win over many of Obama's proponents is an indication that the President's unpopularity in the state can't be held completely responsible for Lincoln's difficulties. She does nevertheless win nearly 80% in the head to heads with the Republicans because she's clearly a more acceptable choice for those voters than the alternative but then the concern in an off year election becomes whether those folks even show up if they're not enthusiastic about casting a vote for Lincoln. If Lincoln has perhaps seemed indecisive at times you can see why when she has it coming at her from both ends of her party. Arkansas has the most conservative independents of any state we've polled in this year and it shows in Lincoln's numbers with that group. Just 27% of them approve of her job performance to 51% disapproving. She has a 21 point deficit in the horse race with that group against Baker and Coleman and a 16 point disadvantage against Cotton. So what's the bottom line here? Clearly Lincoln could be beaten, but there are several reasons why she might survive too. The first is that none of her potential Republican opponents have shown the ability yet to raise the money to run a strong campaign. Whoever emerges as her opponent is also going to need to be able to keep their foot out of their mouth, something that's been a problem for some potential foes. The second is that Democrats nationally are in a recession right now and that goes a long way toward explaining these numbers. But if the economy starts turning around by this time next year and the folks in power get the credit, all of their folks running for reelection will get lifted up, including Lincoln. Republicans have an opportunity here but it remains to be seen whether they can take advantage of it. Yesterday Kay Hagan and Richard Burr gave their divergent opinions on health care to the NC Agribusiness Council. Hagan and Burr may be representing the same state but their supporters, not surprisingly, are quite divergent and they're both taking the positions they need to on this hot button issue to keep from antagonizing their base. On our most recent poll 78% of respondents who expressed approval of Hagan's job performance said that they supported Barack Obama's agenda on health care. At the same time 82% of respondents who said they like the job Burr is doing said they opposed the President's plans. So there is not a lot of ambiguity about where the core supporters of either Senator stand. If either strays from the party line they risk quite a bit of unhappiness from the voters most responsible for putting them in office. Another good statistic on Burr and Hagan that serves to show how polarized the state's electorate is right now: only 8% of North Carolinians approve of the job that both of their Senators are doing. The Senate numbers we're releasing tomorrow in Arkansas will show Blanche Lincoln trailing a couple of her potential GOP opponents by amounts well within the margin of error. I think this will be the first poll this cycle showing Lincoln trailing anyone, which got me to thinking about how many seats up next year that there has been at least one poll showing a party change for. This would seem to suggest a possibility of anything from Democrats picking up 5 seats to Republicans picking up 9. Of course there are a lot of caveats here. The only polls showing Richard Burr trailing were against Roy Cooper, who's now out. Likewise in Colorado where only Bob Beauprez showed a lead against Michael Bennet. Beyond North Carolina the other four potential Democratic takeovers are clearly winnable with the candidates already running. On the Republican side the only three seats that appear to be clearly winnable with the folks already in are Connecticut, Illinois, and Pennsylvania. Arkansas, Nevada, and Colorado all have weak Democratic incumbents but at this point have equally weak GOP fields. It remains to be seen whether the Republican candidates in those places will be capable enough to mount winning campaigns that take advantage of the incumbents' vulnerability. North Dakota, Delaware, and New York are all contingent on a single person running. If John Hoeven, Mike Castle, and George Pataki decide to get into the race in their respective states it will be very competitive. If any of them don't those seats likely remain safely Democratic. So while Republicans may have more places where it appears they could play offense, the quality of those opportunities is perhaps not as strong as it is for the Democrats. And Texas, Louisiana, and California could be competitive as well, although no polling yet has shown a party change in any of those states that I'm aware of. The bottom line is that there is a very wide range of possibilities for what could happen next fall, there's still a lot up in the air about where those battlegrounds are going to be, and no one can tell at this point how any of this is going to shake out. -60% of voters oppose Barack Obama's plans for health care, with just 29% in support. Independents are arrayed against it 73-20. Even among Democrats just 54% say they're for it and among white Democrats it's less than a majority. -Only 45% of voters in the state say they believe Obama was born in this country, while 31% say they think he was not and 24% are unsure. Arkansas is the first of four states where we've polled the birther issue (Virginia, North Carolina, and Colorado were the others) and found less than half of respondents confident that the President is a natural born citizen. The numbers are particularly dramatic among Republicans with 49% saying Obama was not born here to just 23% who grant that he was. -55% of Arkansas voters say they prefer Rush Limbaugh's vision for the country to Barack Obama's. That includes 92% of Republicans, 64% of independents, and even 18% of Democrats. This is in spite of the fact that respondents on balance actually dislike Limbaugh, with 44% holding an unfavorable opinion of him to 35% positive. Overall Obama's approval rating is a negative 40/56 spread, headed in the wrong direction since it was a positive 47/45 back when PPP surveyed the state in March. Obama has the approval of 72% of Democrats, 30% of independents, and 9% of Republicans. Some folks are surprised that Blanche Lincoln is increasingly being thought of as vulnerable and that Arkansas' three Democratic House members made the NRSC's target list, but when you look at the baseline political conditions in the state you can see why the GOP thinks they might have some opportunities here. We'll have numbers looking at Lincoln's situation tomorrow. The poll we're releasing tomorrow shows Barack Obama's approval rating in Arkansas ever so slightly higher than what he received at the ballot box there last fall. At the same time our polling in Colorado last week found him lagging his November vote share by five points. What explains that dichotomy? Like many things involving Obama, I think it comes down to race. Our national poll last week found that 88% of whites who voted for Obama approve of the job he's doing- pretty impressive. But 99% of the African Americans who voted for him like how he's doing- in terms of raw data it was 92 approving of him and 1 unsure. It stands to reason then that regardless of how well Obama did in a state last fall, where his approval rating now falls in relation to his vote share in that state has a lot to do with how large its black population is. There are two states where we've polled a standard electorate (we're looking at a 2009 electorate in Virginia and New Jersey) and found Obama's approval running four points or more behind his vote share. Both of them- Colorado and West Virginia- have populations that are only 4% African American. That leads me to believe that if we polled a New Hampshire or Iowa- other states favorable to Obama but low on black voters- he might have weaker approval numbers in those places too. On the other hand we've found Obama with approval ratings significantly better than the percentage he got in November in a couple of deeply red but also heavily black states- Louisiana and Alabama. I could be wrong, but this is the best data driven theory I can think of for why his numbers are surprisingly poor in Colorado. Arkansas Preview/Where should we poll? We were due for a New Jersey poll this week but we skipped it to do Arkansas instead. -Tomorrow we'll have numbers related to Barack Obama. A few hints to give you an idea of the landscape there right now: less than half of white Democrats support Obama on health care, fewer than half of voters overall think Obama was born in the United States, and 64% of independents think Rush Limbaugh has a better vision for the country than the President. -Wednesday we'll have updated Senate numbers and Thursday we'll look at Governor. So that makes it tempting to skip Virginia in the cycle instead of New Jersey, but it would also be interesting to see if Creigh Deeds going up on the air is narrowing things any. So since we want to survey whichever state is of greater public interest, we're just going to let you vote and decide at the top of the page. We'll poll the winner this weekend and it will come out next week, the other state we won't go into the field again probably until mid-September. There are remarkable differences in how Republican voters view Mitt Romney and Sarah Palin based on their class and education level. Among Republicans who make less than 25k a year 73% view Palin favorably but only 38% say they like Romney. Expand that to less than 50k a year and the gap closes but is still pretty wide- 75% with a positive opinion of Palin to 46% for Romney. At the top of the pay scale it's a different story. Among GOP voters who make 75k on up the two are equally popular, with each seen positively by 66%. And when you restrict it those who make over 100k, Romney becomes the more popular one at 74% to Palin's 61%. The divide is even wider on education level, at least at the low end. Among Republicans who have no schooling beyond high school 78% view Palin favorably while only 29% have a positive opinion of Romney. Expand that group to people who have some college education short of a four year degree and the gap narrows a little bit but remains wide at 72% favorable for Palin and 45% for Romney. If Romney's going to win the nomination in 2012 he probably has to convince downscale GOP voters that he understands and shares their values and isn't just some rich guy who was born with a silver spoon in his mouth. And Palin's going to need to be able to convince wealthier Republicans that she's not just a social conservative, but also someone who can bring good leadership to the table that helps businesses and the economy. So yesterday I wrote a post about how the preferred 2012 Presidential candidate of the birthers was Sarah Palin. In no way did I suggest or do I suggest that Palin herself is a birther but this got her supporters all riled up and they've been sending lots of e-mails the last 24 hours. why is it so hard for Obambam to come forward with his offical (the one under lock & key) BC and what about the rest of his transcripts, etc from his "college" daze? why keep something secret unless you have something to hide? Or you just being paid to act like one? I read your recent poll where you tried to link Gov Palin with so called"
supremacists supported Obama over McCain....so what did that tell you? I am writing in response to your disgusting smear campaign against former Governor Sarah Palin. Your attempt to associate the Governor with a discredited conspiracy is pathetic and beneath the dignity of your firm. Are you aware of the polls that show 35% of democrats believe Bush was responsible the 9/11 attacks (http://www.realclearpolitics.com/articles/2009/08/03/each_party_has_its_fanatics_97748.html). Why dont you write about the leftist fringe conspiracy theorists that make up the core of Obama's base? You sir may think of yourself as a blogger or an author but in truth you are nothing more than a professional liar and an unfortunate waste of skin. There have been some fundamental changes in the political landscape in North Carolina over the last six months as Bev Perdue's popularity has plummeted and Barack Obama's approval rating has seen a more modest drop. Where 48% of North Carolinians identified themselves as Democrats in February, that's now down to 44%. Republican identification has increased from 35% to 37% and the percentage of independents has gone from 17% to 19%. The shifts are a result of Republicans consolidating their support among conservatives and narrowing the gap among moderates. In February 60% of conservatives identified as Republicans and 26% as Democrats. Now they've gained six points and Democrats have lost six points with that group to make it 66% Republicans and 20% Democrats. Six months ago among moderates 55% were Democrats and 18% were Republicans. The GOP has narrowed that gap by ten points, to 51% Democrats and 24% Republicans. There are still virtually no liberal Republicans in the state, but the percentage identifying as Democrats has declined in conjunction with an increase from 9% to 15% of voters on the left calling themselves independents. What does this all mean? It explains why Richard Burr's lead against a generic Democrat is increasing even as his approval rating stays mired in the 30s. It also means that Democrats are probably at their highest risk of losing control of one or both chambers of the Legislature since 2002. There has been a definite up tick in Republican fortunes over the last six months. Of course it's still more than 14 months until election time and things can change back just as fast, especially if the economy starts to turn around and Obama and the Democrats get the credit. In poll numbers that likely reflect early name recognition more than anything else, Scott McInnis and Bob Beauprez start out with the leads in the Republican primaries for Governor and Senator in Colorado. Beauprez's initial advantage is particularly unsurprising given that he's run statewide and both of his current opponents are local officials. He's at 41% to 23% for Ryan Frazier and 15% for Ken Buck. 76% of respondents said they didn't know enough about Frazier to have an opinion about him, and 65% said the same about Buck. Beauprez, on the other hand, is a blank slate to only 33% of likely primary voters. All three have positive favorability ratings. Beauprez is at 50/17, Buck at 29/6, and Frazier at 16/7. In the contest for Governor, McInnis leads Josh Penry 36-15. There is a lot of ambivalence toward both candidates in that race at this point as well. 54% of primary voters have no opinion about Penry and 38% say the same about McInnis. Among those who do the former Congressman is viewed favorably by a 53/9 spread and the Senate Minority Leader has a 40/7 ratio. There are not any significant ideological divides in support between the candidates at this early stage. McInnis leads by 21 points with moderates and by 24 with conservatives. Beauprez has an 18 point lead with moderates and a 20 point advantage with conservatives. These numbers will doubtless change a lot in the coming months as voters become more familiar with the candidates. A commenter on the post about who the birthers like- Sarah Palin- asked for a breakdown on who Republicans who do think Barack Obama was born in the United States like. Great question. 60% of those folks (the reasonable wing of the party?) have a favorable opinion of Mike Huckabee, 58% have one of Sarah Palin, 57% have one of Mitt Romney, and 52% have one of Newt Gingrich. When it comes to favorability spreads with those voters Huckabee's at +43, Romney's at +40, Gingrich is at +29, and Palin is at +27. That's because Palin's negatives with that group are at 31% while Gingrich is at 22%, and Huckabee and Romney are at just 17%. So there is a definite divide between what the birther wing of the party and the non-birther wing of the party think about Palin and Romney. This is no surprise but the ideology breakdown among GOP birthers is 69% conservatives and 30% moderates, while it's 53% moderates and just 46% conservatives among non-birthers. The fact that none of the GOP candidates exceeds a 60% popularity level with Republican voters who think Obama was born in the United States may speak to the need for 'none of the above' to be the party's nominee in 2012 if they're going to get the moderate votes they need to win the Presidency back. I continue to think the best hope for them to win is to go outside the quartet of early favorites we've been polling on a month to month basis. Americans for the most part support giving Michael Vick a second chance and letting him play in the NFL this season. 49% favor his reinstatement while 34% do not and 17% are unsure. I was curious how this issue would break down along party lines. Democrats tend to be more into second chances but they also tend to be more into animal rights. It turns out there is a pretty big schism on that front with Democrats supporting reinstatement by a margin of 56-26 while Republicans oppose it 45-39. Who knew Vick was such a partisan issue? Independents support letting him play 52-31. There is an even stronger divide along racial lines with African Americans supporting reinstatement 80-9 but whites by only a 42-39 margin. That made me wonder if the party divide was simply a reflection of the racial divide with almost all blacks being Democrats. White Democrats support letting Vick play 42/35, while white Republicans oppose him 38/45. So there is a partisan divide beyond the racial divide but it is not quite as stark. In addition to the race and party stuff there is also a large gender gap on the Vick issue. Men are in favor of letting him play by a 61-27 spread while women are actually opposed 40-38. Of course it's interesting to see what broader public opinion on this is but ultimately it's going to come down to one guy- Roger Goodell. But just for fun, if you want to know how folks matching the Commissioner's demographics- white men in the 46-65 age range come down- it's 54% for reinstatement to 34% opposed. So if Goodell's reflective of his brethren maybe we'll see Vick in week 7.
Who do the birthers love? -Not surprisingly only 16% of them approve of Obama's job performance while 75% disapprove. I think Mike Littwin might have hit on a pretty good point in the Denver Post today, which is that some of the people who purport to be birthers might not really believe it but that it's shorthand for their general unhappiness with the President. -The birthers love them some Sarah Palin. She's the most popular politician in the mix with them at 66% favorability. Next is Mike Huckabee at 58%, followed by Newt Gingrich at 46%, and Mitt Romney at 43%. I mean this with all sincerity- Romney's lack of popularity with the birther wing of the GOP really could scuttle his chances at the nomination in three years. Looking at the numbers from another angle- 63% of all Americans with a favorable opinion of Sarah Palin are birthers. Same thing with 53% of those who like Gingrich, 50% who view Huckabee positively, and 44% for Romney. Remember when W. said 'some people call you the elites, I call you my base?' Swap out birthers for elites and you've got the makings of a great Palin speech. I got quite a vociferous e-mail today saying the only reason our Colorado polling was showing Michael Bennet and Bill Ritter in such bad shape was that we had our party weighting all wrong. We don't weight for party- we weight for fixed demographics like gender, race, and age and let the party ID fall where it may- because unlike those other things people can change their party. It was actually pretty ironic to get an e-mail from a Democrat about this because last year every time we put out a Colorado poll it was the Republicans complaining about the very same thing. Given that both the 2008 exit poll and the state's registration statistics show a 1 point advantage for Republicans, the 3 point advantage for them we found in this poll seems perfectly reasonable in this political climate. Anyway this person asked me to recalculate our results using the state's registration breakdown of 35% Republicans, 34% Democrats, and 31% other. Here's what you get using those numbers. Bennet's approval rating is 33/35 rather than 31/38 and he trails Bob Beauprez 41-39 instead of 42-39. Ritter's approval rating is 41/45 rather than 40/45 and he trails Scott McInnis 45-38 instead of 46-38. In other words changing the party id breakdown helps the Democrats, but only by a very small amount. Bennet and Ritter aren't doing poorly in our poll because of the party breakdown, they're doing poorly because a) Republicans disapprove of them more strongly than Democrats approve of them and b) Republicans are more committed at this very early stage to voting for Beauprez and McInnis than Democrats are to supporting Bennet and Ritter. Only 40% of Colorado voters approve of the job Bill Ritter is doing as Governor and he trails Scott McInnis by eight points in a potential match up. The good news for Ritter is that despite a tough budget cycle his approval rating hasn't really changed since PPP surveyed the state in April. At that time his approval was 41% with 49% of voters disapproving of him. Now the spread is 40/45. Ritter has actually seen slight improvement in his reviews from Republicans and independents over that time. With GOP voters he's at 18/69 now, compared to 15/76 then and with independents it's 41/45 compared to 40/52. Where he's dropped is with Democrats. What was a 70% approval rating is now a 64% approval rating with his base. That's bad news not just for Ritter but also for Michael Bennet, Betsy Markey, and other Colorado Democrats who have to run next year. In a midterm election it's the Gubernatorial race that generates turnout and a lack of enthusiasm for Ritter among Democratic voters could lead them to just stay home. In possible contests against Scott McInnis and Josh Penry Ritter trails 46-38 and is knotted up at 40 respectively. Those numbers are probably more a reflection on the incumbent than the GOP challengers, as each of them is mostly unknown to Colorado voters. 45% have no opinion about McInnis, with 30% holding a positive one of him and 25% seeing him unfavorably. Penry is even less well known, with 57% ambivalent toward him while 23% see him favorably and 20% have a negative opinion. How is McInnis leading Ritter? Again it's largely a reflection of party unity. While only 69% of Democrats say they'll vote for Ritter, 79% of Republicans says they'll vote for McInnis. There continues to be evidence that the Bennet appointment hurt Ritter with Hispanic voters. While Barack Obama had a 69% approval rating with them in this survey, Ritter's is just 46% and in the head to head with McInnis they're tied at 38 with that demographic. He's going to have to continue to mend fences in that key Democratic constituency to get reelected next year. He doesn't have to stand before the voters for more than 14 months and a lot could change before then, but at this point Ritter has some work to do if he wants a second term. Bob Etheridge is the latest potential Democratic Senate candidate in North Carolina and we will get him included on our next poll. Etheridge has some definite strong points, namely that he been a consistent winner in a district that on balance leans Republican at the Presidential level. He has won a Congressional election against a GOP incumbent before, just as he will have to do if he challenges Richard Burr. I think he could wage a pretty effective populist campaign that would create some strong contrasts with the incumbent. There are some negatives too. Voters don't like Washington right now and he can't run as an outsider (he's been there for 16 years and I've only been there for 14 years doesn't quite work!). A rural candidate may not be able to get Democratic voters fired up in the urban centers where they have to rack up the vote to win statewide. And most importantly it would set up a competitive House race. If Etheridge does run there is no doubt who Democrats should recruit to go for his House seat- former Treasurer Richard Moore. He may not have done too well in the primary for Governor last year, but a lot of Democrats have buyer's remorse now on that front, and he sets up well for the district. He was actually the nominee in 1994 but given that David Price managed to lose that year as well it's hard to really hold that loss against Moore. Etheridge's biggest plus from a logistical stand point is that he has a lot more money on hand than anyone else eying the race, and he's in a position to be able to raise more of it better than any of the other folks on the table. With national Democrats now having to defend seats in places like Connecticut, Illinois, and Pennsylvania having a candidate who doesn't need as much national fundraising help would be a definite plus. If Etheridge gets in it's probably game over for the nomination. It's hard to see anyone else looking at the race getting the sort of financial backing they would need to be competitive with him in a primary. It'll be interesting to see how this develops. In this particular iteration of the poll, Huckabee comes the closest to Obama that he has yet, trailing just 47-44. That's tightened since the President led 48-42 a month ago. Huckabee also has the best overall favorability rating of the Republican quartet we tested, at 45/28. Huckabee is not the most popular candidate among GOP voters though. While 66% of them have a favorable opinion of him, 72% have a favorable opinion of Sarah Palin. Palin's overall numbers have seen a pretty steep decline in the last month though. Two July surveys we conducted actually showed her numbers slightly improving from pre-resignation announcement levels, to a 47/45 spread. That's now dropped to 40/49. Among Democrats she's gone from 25% with a favorable opinion of her to 15%, and among independents she's gone from 45% to 37%. In her head to head contest with Obama, Palin is down 52-38 after her 51-43 deficit a month ago had been the closest we have measured for her to date. After Huckabee Mitt Romney polls the closest to Obama and also has the second best net favorability rating, at 37/34. He trails 47-40 in a head to head. There continues to be one pretty bad piece of news for him in these polls though, which is that he's the least popular of this quartet with GOP voters. Only 52% have a favorable opinion of him, and that lagging popularity with the overall Republican electorate has become a continuous theme in our 2012 surveys. Newt Gingrich, seemingly the least likely nominee of the bunch, trails Obama 49-41 and has a 33/42 negative favorability rating. It's good news for Obama that even as he navigates a difficult period of his Presidency he's still preferred to any of his Republican alternatives. The margins definitely aren't what they were earlier this year though. Watch or Listen to PPP: Here's a TV story about Bev Perdue's popularity in Charlotte, a local NPR story about broader implications of the city's mayoral race, and an interview we did about our Colorado polling with David Sirota on AM 760 in Denver- the part with us starts a little more than half way through the file. 2012 Poll coming tomorrow: For the fifth month in a row Mike Huckabee is the strongest Republican candidate. Compared to last month Huckabee is up, Sarah Palin is down, and Newt Gingrich and Mitt Romney are pretty much static. Palin's drop is not among GOP voters but mostly among Democrats and independents- my question is why now? She didn't show a decline on two July polls conducted after her resignation announcement. Colorado Governor tomorrow also: Bill Ritter's approval rating among Democrats is only 64%. That's bad news for him but it's also bad news for Michael Bennet and Betsy Markey because the Governor's race is likely to be the largest turnout driver in Colorado next year and if Democrats aren't enthused about Ritter there's a risk they might not show up at all. We'll continue to watch how this develops. Some national number trends: Republicans are closing the gap among moderates. In April 45% of them were Democrats and just 18% were Republicans. Now it's 42% Democrats and 27% Republicans. But there are still 18 conservative Democrats for every liberal Republican. Media coverage fail: Another day with stories about the possibility of Pat McCrory running in the 8th district, another day of said stories failing to mention that McCrory doesn't actually live in the 8th district. He can legally run but Larry Kissell's going to be tough enough to beat without serving him up that carpetbagger softball to hit out of the park. I wrote all of this on Twitter already, for the fastest PPP news and updates follow us there. Barack Obama's approval rating in Colorado was 49% in April and now four months later it's still 49%. 47% of voters disapprove of the job he's doing and 4% aren't sure. His reviews are highly polarized along partisan lines with 88% of Democrats but only 13% of Republicans saying he's doing a good job. Independents split almost evenly with 48% giving him good marks and 46% disapproving. Both of our Colorado polls since he took office have found Obama's approval lagging the 54% of the vote he received in the state last year and a Gallup study last week had his popularity there ranking 43rd out of 50 states, behind many places where he did much worse at the ballot box last year. That begs the question: what's Obama's problem in Colorado? -Obama's numbers with Democrats and Republicans now are virtually identical to the share of the vote he got, but he's slipped among independents. He won about 60% of the independent vote but now has just a 48% approval rating with them. -While Obama is pretty much steady with high approval among Hispanic and black voters, only 44% of whites approve of the job he's doing where 50% of them voted for him. -His approval rating among young voters (good) and old voters (bad) is similar to what he got in November but he's dropped from winning about 56% of the vote from middle aged voters to a 49% approval rating with them. One issue that's not helping Obama too much in the state is health care, as 51% of respondents say they're opposed to the President's plans with just 38% in support. The 'birther' movement is relatively strong in Colorado. Just 58% of voters in the state will say for sure that they think Obama was born in the United States while 24% believe that he was not and 18% are unsure. This line of thinking is particularly prevalent among Republicans, 43% of whom think the President was not born in the country compared to just 33% who think he was. One thing Colorado voters can be proud of though is their awareness that Hawaii is part of the United States. A PPP national poll released earlier today found that only 90% of Americans overall think that it is, but 97% of folks in Colorado do. After we conducted polls over the last couple of weeks finding significant numbers of 'birthers' in North Carolina and Virginia, we decided to take the question national but also drum down more specifically on where exactly the people who think Barack Obama wasn't born in the United States do think he's from. So who are the birthers? PPP's newest national survey finds that there has been very little change in public perceptions of Barack Obama since election day last November. 52% of voters in the country approve of the job he's doing so far, while 42% disapprove. Only 4% of people who voted for him last fall now disapprove of his performance, and just 10% who voted for John McCain now approve of his performance. By and large voters made up their minds about the President a year ago and there's been little to change that since he took office. 85% of Democrats but just 16% of Republicans think he's doing a good job. Independents are pretty evenly divided but with a slight lean toward Obama- 48% approving and 42% disapproving. He's maintained high levels of approval with black voters (91%) and Hispanics (62%) but by a 49-44 margin more whites disapprove than approve of his work. While Obama's overall popularity remains pretty strong his health care plan is not faring as well in the court of public opinion. 47% of voters say they oppose it with just 40% in favor. The problem for Democrats on this count is that the scientific data actually confirms the perception being created by the town halls that Republicans are stronger in their opposition to this than Democrats are in their support of it. 83% of GOP voters say they are against Obama's efforts while only 70% Democrats say they're supportive of them. Independents are also arrayed against them by a 49/35 margin. One question we asked on this poll gives a good idea of how difficult it is to inform the public on this complicated issue. Medicare is obviously an inherently public program, but just for the heck of it we asked the somewhat tongue in cheek question of whether the government should 'stay out of Medicare.' 39% of Americans said yes with just 46% opposed. When such a large swath of the electorate claims not to even want government involvement with Medicare you can see what a tough sell Obama and Congressional Democrats have in convincing the public there should be a larger public role in the health care system. We'll release the numbers looking at 2012 match ups for Obama tomorrow. Bev Perdue opened an office in Charlotte and has made a point of visiting the city, but voters there still don't think she's been attentive to them since taking office. 58% of voters feel she's been inattentive to the city's needs so far, while just 25% think she has been. It's no surprise that 77% of Republicans and 63% of independents feel that way but even among Democrats 42% think she should be doing more for Charlotte while only 37% feel like she's done a good job so far on that front. Perdue's overall rating with Charlotte voters, at 32% approval and 52% disapproval, is actually better than her statewide numbers. That may not be saying much though given what a Democratic city it is. 48% of Democrats, 28% of independents, and 11% of Republicans give her positive marks. Perdue has a long way to go if she hopes to replicate her surprise victory in the city last year in 2012. Much more popular with Charlotteans is Barack Obama, who has a 52% approval rating with 42% disapproving of his job performance in the city. 84% of Democrats, 48% of independents, and 9% of Republicans give him good reviews. Obama's basically been pursuing a swing state strategy in the places he's visited since taking office, so who knows, maybe we'll see him in Charlotte for Anthony Foxx sometime during early voting. Given that his approval runs 17 points ahead of Foxx's vote share with independents, a visit from him could prove to be decisive in what's shaping up as a very close race. Michael Bennet's approval rating is just as bad as it was when we polled Colorado in April but voters in the state don't like any of his possible Republican opponents either, leaving this Senate contest pretty wide open. 38% of voters in the state disapprove of Bennet's job performance so far with 31% approving. Those numbers are roughly equal to our previous survey which found the numbers at 41% disapproval to 34% approval. There are two primary reasons for Bennet's net negative ratings. The first is that Republicans disapprove (62%) of him more than Democrats approve of him (57%). The second is that he's getting unfavorable reviews from independents, 36% of whom disapprove of him compared to 29% approving. One piece of good news for Bennet is that he's getting better reviews now from the key Democratic constituency of Hispanic voters now than he was when we polled the state in April and January. 38% approve of the job he's doing with just 27% disapproving. It had been 41% disapproving and 33% approving earlier, perhaps a reflection of unhappiness that Ken Salazar was not replaced by another Hispanic senator. Potential Republican opponents Bob Beauprez, Ryan Frazier, and Ken Buck all get overall negative reviews from voters in the state as well. 40% have an unfavorable opinion of Beauprez to 30% with a positive one. For Frazier it's 19% negative and 11% favorable and for Buck the numbers are 18% unfavorable and 17% favorable. In head to head contests Beauprez leads Bennet 42-39, while the incumbent has a 39-35 advantage over Buck and a 38-33 one against Frazier. Bennet's numbers are partially a reflection of the downward turn in Democratic fortunes nationwide over the last few months, as seats that were thought to be safe for 2010 have come into play in conjunction with the decline in Barack Obama's approval rating. It's also a function of the fact that most voters still don't know him very well, something that his prodigious fundraising will be able to rectify in spades next year. Despite these initial numbers it's hard to really imagine Bennet losing to Beauprez after the Republican's incredibly weak campaign for Governor in 2006, unless the 2010 election turns out to be a Republican landslide along the magnitude of 1994. Nevertheless it's not very hard when looking at both Bennet's approval numbers and the weak ones of the current likely GOP field that Jane Norton is now eying the race- this race could be pretty wide open. PPP will be releasing Republican primary numbers in both the races for Senate and Governor later in the week. We were the only pollster to correctly show Barack Obama taking Colorado with 54% of the vote last fall. When we polled Colorado in April and found both Michael Bennet and Bill Ritter with pretty iffy numbers that was the first time I started thinking Democrats might be in a little bit of trouble. The next week we polled Illinois and found Alexi Giannoulias and Mark Kirk tied- that furthered my sense things were shifting, and pretty much every poll we've conducted since then has fit that pattern. So this week we're back to Colorado and there's good news for Democrats: things aren't really any worse than they were in April in the state. And there's good news for Republicans too: they had to like where they stood when we conducted that poll. Tomorrow we're going to have Senate numbers, Wednesday we'll have Barack Obama's approval and related questions, Thursday we'll have Governor numbers, and Friday we'll look at the Republican primaries for Governor and Senate. One big observation from the numbers we'll be releasing tomorrow: all four major Senate candidates have negative approval/favorability numbers. The field certainly is devoid of heavyweights for a race without an elected incumbent, and voters in the state aren't that enthralled with their choices at this point. And lest you think all the birthers are in the south, 43% of Colorado Republicans think Barack Obama was not born in the United States, 33% think he was, and 24% are unsure. Colorado is more down with the whole 'Hawaii is part of the US' thing than North Carolina voters were though. That stuff will be part of the Obama approval release on Wednesday. The groups with the least movement are at the opposite sides of the political spectrum. Liberal Democrats and conservative Republicans both had their minds firmly made up about Obama months ago- the former group generally thinks he can do no wrong and the latter group thinks he can't do anything right. The largest drops have come among independents on both the moderate and conservative parts of the spectrum. Independent voters both in North Carolina and nationally have been increasingly expressing a desire for more divided government, something that could hurt Democratic prospects for taking out Richard Burr next year and may even cause problems for the party in legislative elections. Moderate Democrats and conservative Democrats have had a similar eight point drop, although an 83% approval figure with moderate Democrats is still very impressive for Obama. The fact that he's barely over 50% approval with the conservative wing of his party should be a point of concern for Obama though and it looks like health care may be hurting him with those voters, as just 30% of them say they are with Obama on that issue. It is certainly not panic time for Obama when it comes to his approval rating in the state, but there probably is going to have to be some turnaround in the economy for his numbers to get back to where they were four months ago. Last week Democratic Senate hopeful Kenneth Lewis challenged Richard Burr to a debate on health care. This is the kind of thing you would expect Burr to ignore, especially given that Lewis is somewhat of a dark horse even to win the Democratic nomination. But he said yes, on the condition that Elaine Marshall and Cal Cunningham be invited too. I think Burr's pretty smart on this one. Republicans are winning the health care battle in the court of public opinion and just last week we found 50% of North Carolinians opposed to Barack Obama's health care plans with just 39% in support. His response makes him look good because he's willing to engage with his opponents and stand up for his position but it's also something where a majority of the voters are with him at this point and he can throw some red meat to his base. This is something Elizabeth Dole never would have done- and the more Burr does things differently from Dole the better off he's going to be. The race to be the next mayor of Charlotte is a statistical dead heat, with Republican John Lassiter leading Democrat Anthony Foxx 44-43 in the contest to replace Pat McCrory. Both candidates are pretty popular with the city's electorate. 53% have a favorable opinion of Lassiter, with only 22% viewing him negatively and 48% have a positive one of Foxx with 22% holding an unfavorable opinion of him as well. It's unusual in the increasingly polarized world of partisan politics to see both candidates in a race sporting a better than 2:1 positive favorability ratio. There are two key groups of voters who may well decide this race: independents and the Democratic voters whose crossover support of Pat McCrory has allowed the Republican to remain mayor of the Democratic city for over a decade. Lassiter has a 47-31 lead with independents, but Foxx has the 59-30 advantage with Democrats who approve of McCrory's job performance, indicating that he will do a better job of locking up his party's vote than recent Democratic nominees have. Voters send conflicting messages about the direction of the city. On one hand McCrory has an excellent 57% approval rating, something that should aid Lassiter, who likely would be an extension of the current administration. On the other hand 59% of voters say that it's time for change in how the city is led with only 34% saying they're happy with how things are going currently, a sentiment that Foxx's campaign should be able to successfully tap into. So far in the campaign Lassiter has put a heavy emphasis on his experience, while Foxx has been more focused on his vision for the city. By a 60-28 margin voters say that they are more concerned about a candidate's vision when deciding who to vote for than his experience. -One very good piece of news for Foxx is that black voters appear to be motivated to come out this fall- we expect them to make up at least 30% of the electorate. Right now Foxx has a 70-17 lead with them. If he can push that up closer to Obama levels- 90% or more- he's going to be very difficult to beat. -Although he's certainly doing a better job than most Democratic candidates for mayor have done lately of locking up the white Democratic vote, he's still losing 25% of it to Lassiter at this point. Getting his party more unified around him would go a long way. -Right now he's only getting 62% of the vote from people who approve of Pat McCrory's job performance. If he can do more to convince those folks happy with the current leadership that he'll provide continuity his numbers will improve. -Do a better job of earning support from voters who have a favorable opinion of both him and Foxx- right now the Democrat has a 57-36 lead with their mutual admirers but conceivably those are folks who could go either way- Lassiter needs to get more of them to go his way. This race looks like it will probably be close right to the end. What's the deal in Colorado? Is Obama in a worse position than election day?